FREE - GRAB IT NOW FROM iOS or ANDROID APP STORE! Desi Music is Spotify, IMDB plus Shazam of Bollywood. Nowhere else will you get music, lyrics, movie ratings, star biographies, photo galleries, filmographies, reviews, videos, radios and social integration of music fans worldwide ALL IN ONE APP! 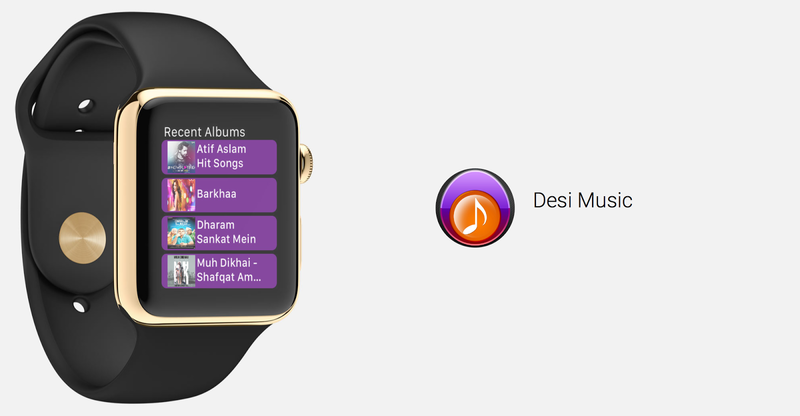 Desi Music is the first and only Bollywood App to be released on Apple Watch! Unlimited feature packed Indian music app featuring HINDI, TAMIL, TELUGU & MALAYALAM music selections along WITH LYRICS. Desi Music iPhone app features Indian, Bollywood music featuring language selection in New Releases, Top 40 songs, Live Radios and Devotional albums. Songs ratings are at your fingertips - you can view song ratings and submit ratings on the fly from the app. Like the song/album? Buy it instantly with Buy link provided in player. * HINDI, TAMIL, TELUGU & MALAYALAM - choose your language to display language specific New Releases, Top 10 songs, Live Radios and Devotional albums. * View FULL LYRICS from player. * View and submit song ratings. * Most popular Top 40 songs are now at your fingertips - play them anytime, anywhere. * Latest Songs in Hindi, Tamil, Telugu & Malayalam. * Browse through numerous categories including compilations, pop, remix, ghazals, love songs, oldies, karaoke, Bengali, Gujarati, Marathi, Kannada, Carnatic, Bhangra. * Search for songs by Album, Song Title. * Language specific Movie Index alphabetical listing. * Facebook Connect - Share your favorite songs on Facebook.